This entry was posted in #BlackLivesMatter, 2018 midterm elections, Antifa, Congress, Conservatives, Constitution, crime, gun control, illegal immigration, Liberals/Democrats/Left, sanctuary cities/states, U.S. national debt, United States and tagged John Philip Sousa IV. Bookmark the permalink. I’m going to add #11, why you’ll vote nex Tuesday. None of the above, I am a freedom loving woman, and I pledge allegiance to my country. 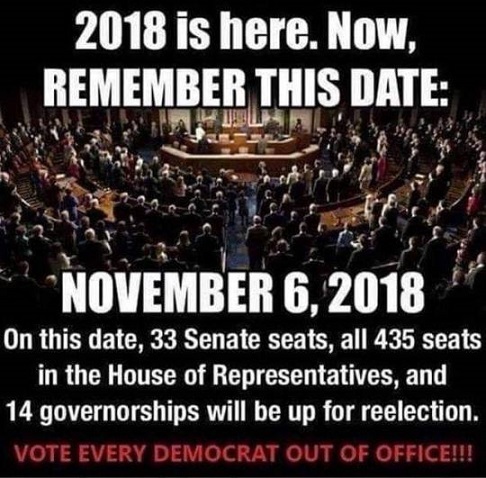 Democrats are supposed to vote on the 7th, not the 6th! I already voted. perhaps states should employ something like an electorial college, so that one city in a state is not able to determine the outcome of an election. I’m pretty sure none of the entrenched establishment would want that though. The Bible says He doesn’t want us to be lukewarm. It is our duty and responsibility to vote. Encourage all the non voters you may know to go out and vote. In 2016, I wrote in Hillary Clinton. For some inconsequential office at the local level, not for President. It wasn’t so much a vote for her, as it was an opportunity to badmouth and call her several names. I could’ve spent an hour “voting”, and used the entire sheet of paper I was given for my ballot. I’ll be sure to spew on somebody else Tuesday. Open borders is priority number one for the globalists. Ever notice how certain agendas proceed forward no matter which wing of the Uniparty is elected. After American citizenship is diluted and it becomes a third world cesspool will the inbred elites start the famine with all the Monsanto seeds? They are hoping the bunkers are deep enough and that the Praetorian guards never abandon post but they won’t be immune from the chaos they create. This is part of the reason why, the Bolshevik/Liberal/DemocRats want mass invasion migration, to vote out the patriot Americans, and vote in Liberal Totalitarianism. This is why the current generation of Bolsheviks are for “Democracy”. Because as in the former Rhodesia & SA, with the Bolshevik control of much of the MSM and exaggerating class,race,religious strife, they can manipulate the voters to “Vote” in their puppet communist politicians and bring in communism via the vote.